When the Oculus Rift launched back in March 2016, the VR headset came with the promise of eventually being partnered with what were described as revolutionary game controllers. The problem was that the Rift launched alongside the HTC Vive, which offered such controllers straight out of the box – and room-scale VR to boot. Then came PlayStation VR, Sony's entry to the virtual reality space that could also offer a similar controller experience but on a more affordable budget. Now, nearly a year later, the Oculus Touch controllers have arrived, but with a huge $199 price tag, making the overall cost of the Oculus VR kit just shy of $800 – even more than the HTC Vive. So why should you go out and spend even more money on the Oculus Touch controllers, when you've already got a perfectly good Xbox One pad? Well, simply put, they're what the Oculus Rift experience has been missing all along. What makes Oculus Touch so expensive? Although the Oculus Rift comes bundled with an Xbox One controller and the dinky remote, which will allow you to play most of the games, the Oculus Touch really does add another dimension to the Rift experience. Whenever we had family or friends round to try the Oculus Rift, their immediate reaction was to reach out and try to touch things they could see in the virtual reality landscape, whether that was a passing swarm of jellyfish, Henry the Hedgehog in the Oculus short film or just the cliff face in front of you in The Climb. Without your hands properly involved, it's hard to feel lost in VR. 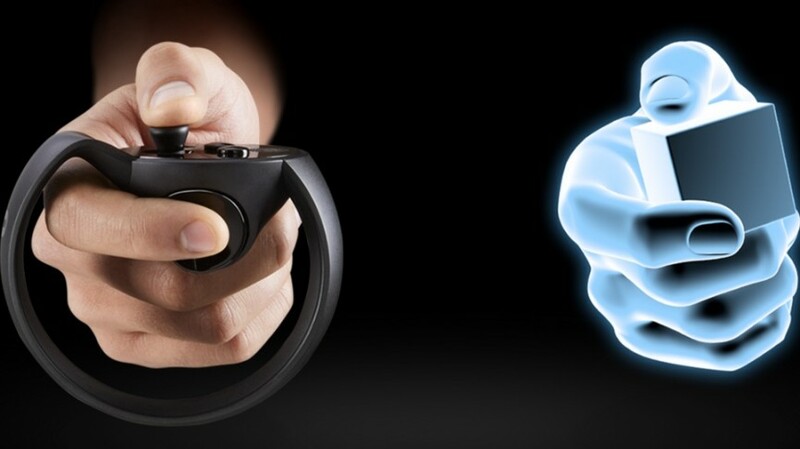 But the Oculus Touch does just that, and the controllers are incredibly clever at doing so. They're designed to wrap around your hand thanks to their "crescent moon" shape, with triggers positioned under your forefinger and middle finger. Your thumbs can then be free to move across the face buttons and an analogue stick each. They're strangely intuitive, and the adorable robot will help you through an interactive tutorial that involves playing with butterflies, shooting laser pistols and more. The Touch even let you point, and give a thumbs up, as the controllers can sense whether you've lifted your fingers off the buttons and triggers, which gives you a few more interaction options in-game. Using the Touch, you can even map out a space in which to play room-scale VR, just like the HTC Vive's wands. They're not as accurate and are a lot more fussy as to where the cameras are positioned, but it's a great way to get a bigger space to play virtual reality games in. The Touch controllers are also a lot lighter than the HTC Vive controllers and feel more natural in your hands too. It's just a shame that they're an additional purchase on top of the $599 you've already spent on the Oculus Rift. However, for that price you do get an extra camera sensor for improving overall tracking, as well as the special Rock Band sensor that lets you turn your existing guitar peripheral into a virtual reality axe. When it comes to Sony's PlayStation Move controllers for the PSVR, there's really no comparison. The accuracy and ease of use of the Touch controllers makes the 2010 tech contained with the Sony peripherals look prehistoric. As Touch controllers are battery powered, too, you won't be constantly recharging the controllers via cables as with the Moves. Any regular PlayStation VR user will tell you that gets to be a real pain. How does Touch change the games? Great controllers that get your mitts on the games' bits are worthless if there aren't any games to actually get your hands on. Thankfully there are over 50 titles already compatible with the Oculus Touch just a month after launch, ranging from those that can only be played with the motion controllers to those that are just massively enhanced by using them. Take Crytek's The Climb for example. This VR free-climbing game has you scaling the rock face, leaping from handhold to handhold as you attempt to reach the summit, re-chalking your sore palms as you go. Now, that's all well and good with an Xbox One controller as your input. It works, by using the triggers to act as your hands in-game. But replace that pad with the pair of Oculus Touch controllers and suddenly you're reaching for handholds in real-life too, feeling the stretch between safety and the fear of leaping across chasms much, much more intensely than with the Xbox One pad. That physicality extends to games like Superhot VR too. Usually we wouldn't recommend a VR port of a PC/console release, but this works so well with the Oculus Touch it's impossible not to. Gameplay is all about controlling time by moving – whether that's dodging bullets, reaching for guns or blunt objects or punching someone right in the face. With the Oculus Touch you're right there in the moment, surrounded by enemies and with all the power to stop them by using your entire body. Without the Touch controllers, you'd just be sat in a chair feeling disconnected. But it's not all about movement, sometimes it's more about getting enhanced realism with the Oculus Touch. Take games such as Arizona Sunshine or Fruit Ninja VR. Both of these put objects in your hands in-game and allow you to live out an alternate reality. Arizona Sunshine is a zombie-killing shooter that gives you a taste of what the apocalypse could feel like, while Fruit Ninja VR is all about getting your samurai on and slashing the heck out of fruit. Neither would be any fun without the Touch controllers – not playable at all in fact – but the same level of immersion also wouldn't be possible. Using an Xbox One pad for games like this highlights the fact that you're playing a game, rather than being inside it, which is the entire point of virtual reality. There's an added sense of hilarity and interactivity with the Oculus Touch too. Two games that were launch titles for the HTC Vive have now worked their way into the Oculus store with Touch compatibility – Fantastic Contraption and Job Simulator. They're both incredibly inventive and although Fantastic Contraption is a puzzle game and Job Simulator is a hilarious simulator of mundane occupations, they both offer fantastic ways to introduce comedy and interactivity to virtual reality beyond wielding a gun, pushing buttons or replicating extreme sports. Our particular favourite Oculus Touch game is one called I Expect You To Die, which might sound morbid, but bear with us. It's actually a James Bond spoof of sorts that flings you into impossible situations and asks you to puzzle your way out – or die. Unusually for a Touch game you play sitting down, but the motion controls are so on point you'll soon forget you're in fact sitting on the sofa. There's role-playing and physics mayhem the likes of which you rarely see in virtual reality games, and it's so consistently clever that you'll want to let everyone play it. This is virtual reality at its best, and totally impossible without controllers like the Touch. So why do you need to buy these controllers? Without the Oculus Touch, you're really not realising the full potential of virtual reality on the Oculus Rift. While it might be an expensive additional expense, there's no denying that the Oculus Rift is just downright better with touch – capital T or not.